Engineers enforce an emergency closure on Park Bridge at Drumoak last month after defects were spotted during a routine inspection. 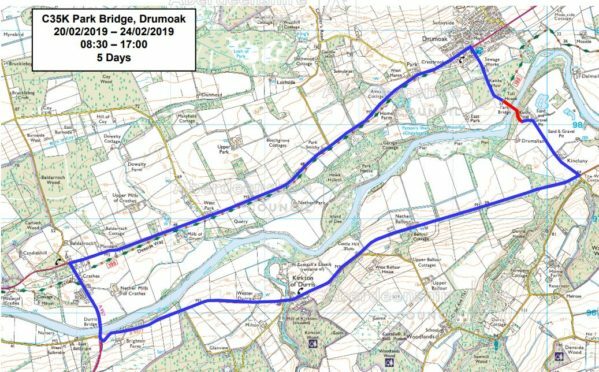 Now Aberdeenshire Council has confirmed the road could be shut until autumn next year to allow repairs to be carried out. Cyclists and pedestrians will be able to use the bridge “for the time being”, the authority has said. The authority has been racked with such problems across the region, with many of its bridges dating back hundreds of years and not designed to cope with modern traffic levels. In 2017 the crossing had to be temporarily shut because roads bosses feared it would be unable to cope with the additional volume of traffic caused by the closure of the nearby Maryculter Bridge for AWPR works. Abbeyton Bridge near Fourdoun was demolished on Christmas Day because it was deemed dangerous. Another bridge in the village has been closed since November after inspections revealed further damage to an embankment after the demolition of a house.